District Court Tiruvallur is 30-04-2019. Tiruvallur District Court Office Assistant and other posts candidates selection will be based on merit in qualification, personal interview and/or written exam. 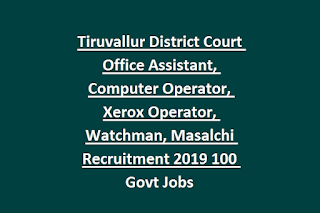 Post wise qualification, age limits, qualification, selection process and other details of this Tiruvallur District Court Office Assistant, Computer Operator jobs recruitment notification 2019 is updated below. 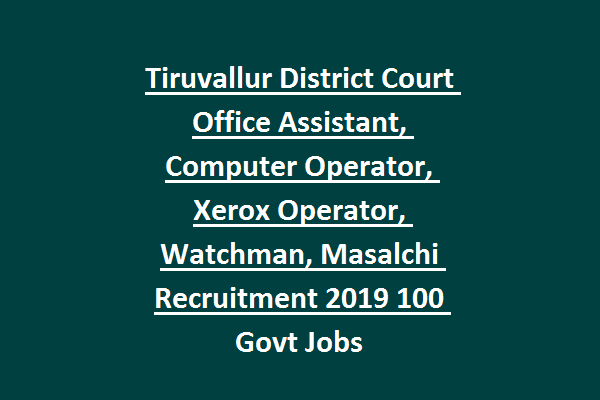 There are total 100 posts in this Tiruvallur District Court recruitment notification. Post name and post wise vacancies are given below. Upper age limit is 30 years for this Tiruvallur Court jobs. Night Watchman, Sweeper, Masalchi -Must know Tamil reading and writing . Candidates selection will be based on merit in qualification and personal interview. Based on received applications candidates will be short listed. Those short listed candidates only called for personal interview. At the time of attending the interview candidates have to bring the original documents of all required. Eligible candidates can submit the application form in a prescribed format to Tiruvallur District Court on or before 30-04-2019. Application form is available to download at Tiruvallur District E Court website along with notification.